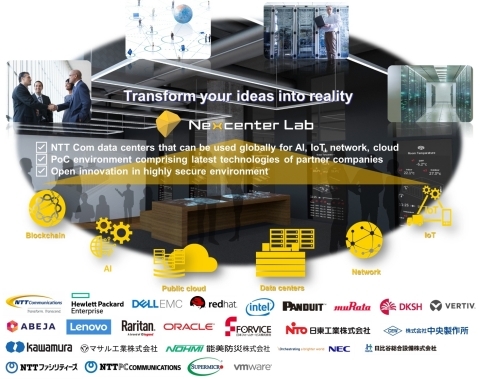 NTT Communications Corporation (NTT Com), the ICT solutions and international communications business within the NTT Group (TOKYO:9432), has announced the launch of the Nexcenter Lab™ program to promote open innovation in partnership with participating companies. The program provides PoC environments for the development and testing of new businesses and services focused on digital transformation (DX), utilizing the latest services and next-generation technologies of NTT Com’s IT partners. The program is available at two of NTT Com’s Nexcenter™ data centers in Tokyo. The program provides participating companies with use of PoC environments as well as exclusive spaces for meetings, seminars and workshops, available 24/7. A key purpose of the program is to enable participants to test and verify their latest technologies and services with the aim of taking these offerings to market at an accelerated pace. They will have access to ICT environments where extra-high-heat servers such as GPU can be used, as well as advanced services of NTT Com and partner companies, such as hybrid cloud, AI and IoT, which can be combined to verify technologies such as deep learning and blockchain. NTT Com will provide connection to its public cloud, free use of server racks in data centers, free use of its Enterprise Cloud service, and more. Partner-sponsored services, including cloud services, ICT devices, SaaS free accounts, etc. NTT Com will implement a variety of initiatives for co-creation among participating partners and clients, and support open innovation based on the ecosystem that will be established through the program. For example, NTT Com will create opportunities for co-creation among participating companies by providing portals to search activities being undertaken by each company in the program. NTT Com will also organize seminars conducted by experts and summits gathering partner companies. In addition, NTT Com will support the efforts of participating companies by sharing case studies, such as the joint implementation of PoC, as well as connect companies with various services. Takeshi Igarashi, Director, Hybrid IT, Hewlett-Packard Japan, Ltd.
Hewlett-Packard Japan, Ltd. welcomes and agrees with the deployment of NTT Com’s “Nexcenter Lab™”. Hewlett Packard Enterprise (HPE) proposes Memory-Driven Computing (MDC) as one of the means for customers to realize DX. HPE announced the launch of an incubation practice with specialized skills through MDC, leveraging the expertise of Hewlett Packard Labs. We support to explore MDC applications and deliver proofs-of-concept that will demonstrate dramatic performance gains never before possible in “Nexcenter Lab™”. We sincerely welcome the launch of the Nexcenter Lab™ by NTT Com. As demand continues to accelerate for new technologies such as AI, IoT and 3DCG which require ever-increasing Graphics Processing Unit (GPU) power, it has become imperative to develop a data center such as NTT Com’s that can handle a large number of GPU servers. Dell EMC is pleased to have contributed to the Nexcenter Lab™’s server and cooling-system infrastructure, which will enable all customers to use GPU power efficiently. We look forward to the Nexcenter Lab™ supporting the development and introduction of next-generation services for customers. Hiroaki Okashita, Senior Manager, APAC Office of Technology, Product and strategy Lead, Red Hat K.K. Red Hat, the world’s leading provider of open source solutions, utilizes the power of innovative opensource technologies to support customers’ DX through collaboration with NTT Com. Specifically, we provide PoC environment through Nexcenter Lab™ based on Red Hat OpenStackPlatform, with highly scalable and more secure cloud capabilities and Red Hat OpenShift Container Platform, the industry’s most comprehensive enterprise Kubernetes platform for building a hybrid cloud environment. In addition, Red Hat helps to solve the problem through a discovery session as a strategic advisor. This can allow customers to promote competitive new services or business models not only to introduce DevOps and microservices, but also to provide GPU as a Service to promote use of AI and machine learning by OpenShift container service optimized for GPU. Going forward, NTT Com will further enrich the program through partnerships with companies from various industries as well as existing partners in IT and other industries. NTT Com also plans to expand the program into the Osaka area in Japan as well as into Thailand globally. We will also cooperate with similar initiatives in Germany and Malaysia. It is hoped that new technologies, services and know-how generated through this program will evolve as de facto standards and thereby contribute to the realization of smart societies. As a DX EnablerTM, NTT Com helps clients transform their companies and create new business through the use of digital data. The NTT Com’s an optimal platform for the valuable use of digital data is being optimized for AI services, data management, servitizing support, global IoT using eSIM and network services that flexibly link multiple clouds, helping to turn data into valuable information and intelligence. Company names and logos mentioned in this release are the trademarks service marks or registered trademarks of their respective owners.